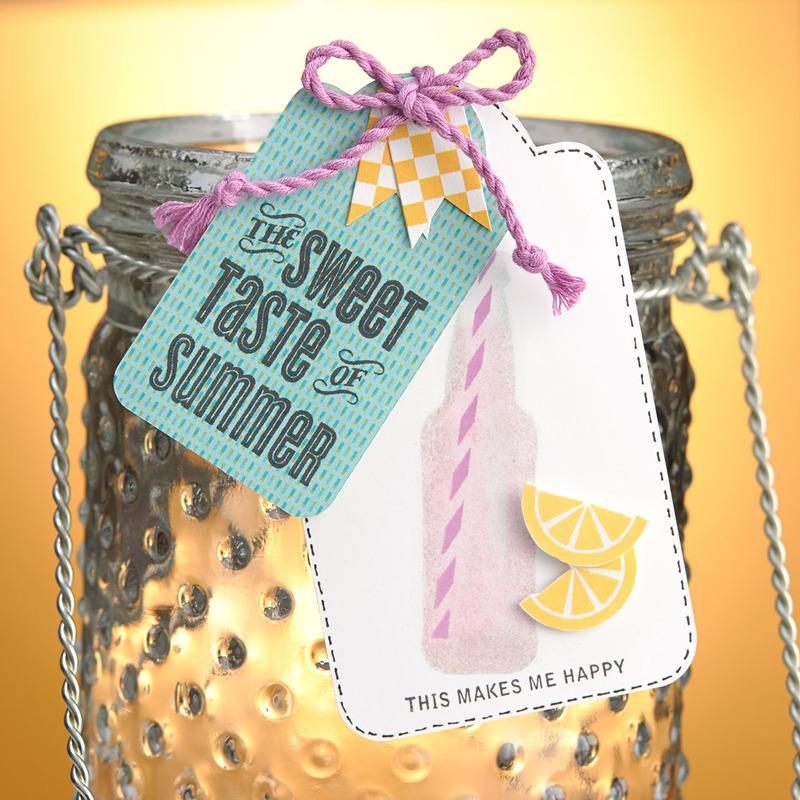 Anyone craving a sip of a refreshing stamping technique? Slide your glass over and we’ll pour you a drink. Today we’re bringing you a behind-the-scenes look at the technique our artist used to create this cool drink of summer. Step 1: Using Pixie ink, stamp bottle image on pad so the top ¾” of the image is not inked. Once inked, achieve a second generation stamp by stamping the bottle first onto your desk pad (or other scratch piece of paper) and then onto your tag. Step 2: Next, use a sponge dauber to lightly ink the edges of the bottle stamp with Whisper ink. Use another sponge dauber to ink the top of the bottle stamp with Glacier ink. Now stamp this image over the original Pixie bottle image on the tag. Step 3: Using Whisper ink and a sponge dauber, lightly apply a small amount of ink to the bottom of the bottle stamp in an oval shape. Stamp bottle image again over previous image. 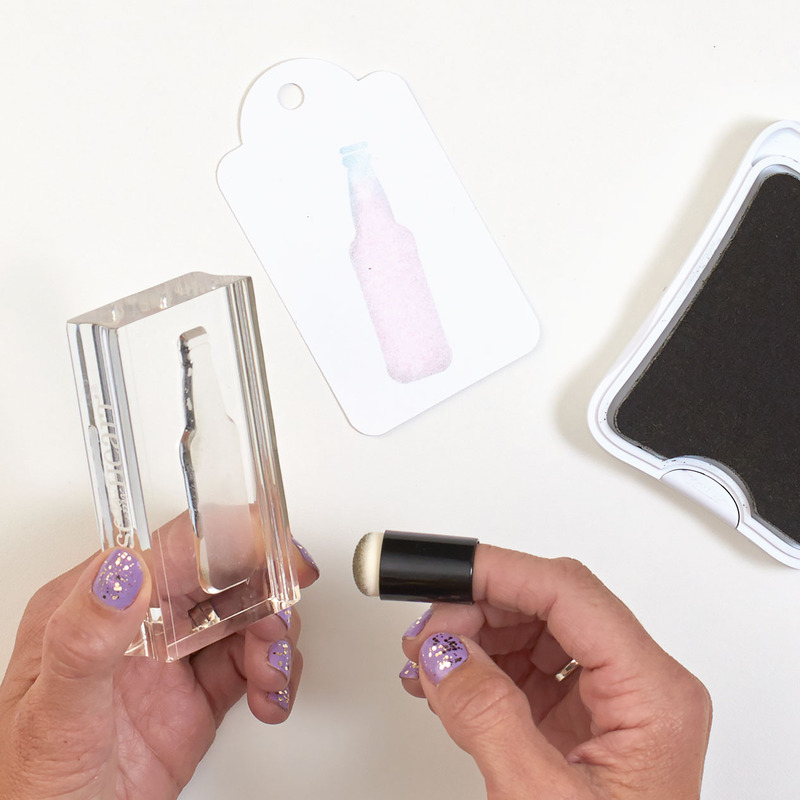 Step 4: Using Thistle ink, stamp straw image onto the bottle, allowing it to rest at the bottom left of the Whisper oval and exit through the top of the bottle. Step 5: Use a sanding file to softly rub away a line to the right of the straw. This will give the bottle a highlight, creating a more glasslike appearance. *For the materials needed to create the rest of this tag (including those mouthwatering lemons), please consult our handy recipe guide.